In a much happier state than when last pictured here, this is N-302, an ex-Dutch twin-seater that ended its days with the Danish Air Force as ET-273. She was built by Fokker for the Dutch Air Force (KLu) and first flew on 30th May 1958. Retired from the KLu in 1967, she was sold to the Royal Danish Air Force and delivered to them in December 1967. Retired once more and bought by Hawkers in 1976 for possible resale, she never returned to the air and by 1981 was on display at the Bomber County Aviation Museum at Hemswell - wearing WT741's nose - which is, coincidentally, now sat alongside her. She was moved to Lovaux at Macclesfield in 1983 and reunited with her original nose again, but by 1985 had arrived at Biggin Hill for use as a gate guard with Hunter One - and fitted with a single seat nose once more, this time from XJ690. ET-273's nose then got kicked about the UK over the next 20 years or so, becoming ever more stripped out and tired looking. 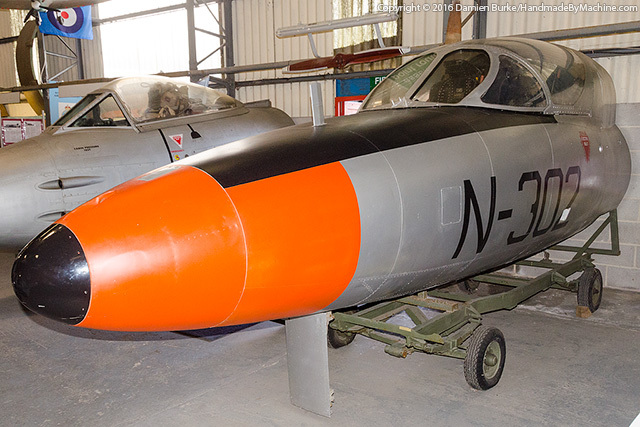 She lost her overall green Danish colours and was stripped to bare metal, and with her final arrival at Aeroventure a cosmetic restoration was begun to put her back into her Dutch colours as N-302. She certainly looks good in silver and dayglo!